Approaching sunset, so time to cruise back down to the Mekong River to disembark. In fact, time now to bring this Trip to a close. After another stroll around Khong Chiam, another fine dinner, several more cold beers, we retired for another good sleep at "Once upon a Time". Next morning, another excellent breakfast, then Tim and I drop Koen [overlanding through Laos to Vietnam, before flying back to Bangkok, as part of his Travel Agent duties] and Piya [looking around Pakse city in Laos before flying back to Bangkok] at a Laos border crossing, and then have leisurely drive back to my house which we reach mid-afternoon. I hope you enjoyed traveling with us. > I really like the idea of making a book for your co-travellers. Nice that we could see it too. Ray: Thank you, Jacquelyn. I have done this after several trips, and the books seem to be well appreciated as mementos. Those are lucky guys, Ray, to get a photobook of this trip. I can tell you all had a blast. What a memory. Ray: Yes...we had an excellent trip, Ginnie. Perhaps, near the end of this year, we might make a trip into Northern Laos and Southern China. Next week I'll start a new series on a visit Tim and I made to Kolkata. Yes, I have enjoyed travelling with you and your chums. It’s a part of the world that i’m Unlikely to see for myself and I can enjoy the trip without any tprosk of being eaten by anything I disagreed with. Great idea on the photo book; I’ve done several myself and they are fun to look back on. I think they will appreciate the photobook. A great series and a great gift to your buddies, Ray. Ray: Thank you, Astrid. I had enough pics for a much longer series, but felt what I showed was a reasonable summary. Next week I'll conduct a visit to Kolkata. Ray: We manage to fit a lot into 5 days and 4 nights, Lisl. Ray: Then I am delighted, Chris. I'll take you to Kolkata next week. the water in both shots is nice but i like the heavy, viscous feel in the top shot more with the curved reflections, Ray. the photobook is a terrific idea! Ray: Thank you, Ayush. I liked that lazy wake. and to drink a beer - wonderful, atmospheric images! Ray: For me, Philine, it represented a fine closing of our very pleasant trip. That snake like reflection is superb Ray. What a shame that the adventure is over so soon. Ray: I liked that reflection, too, Chad. We keep our trips short...get too exhausted otherwise. The photobook is a wonderful reminder of your lovely bike and beer trip! Ray: I thought it might be well received, Philine, and this is how it turned out. 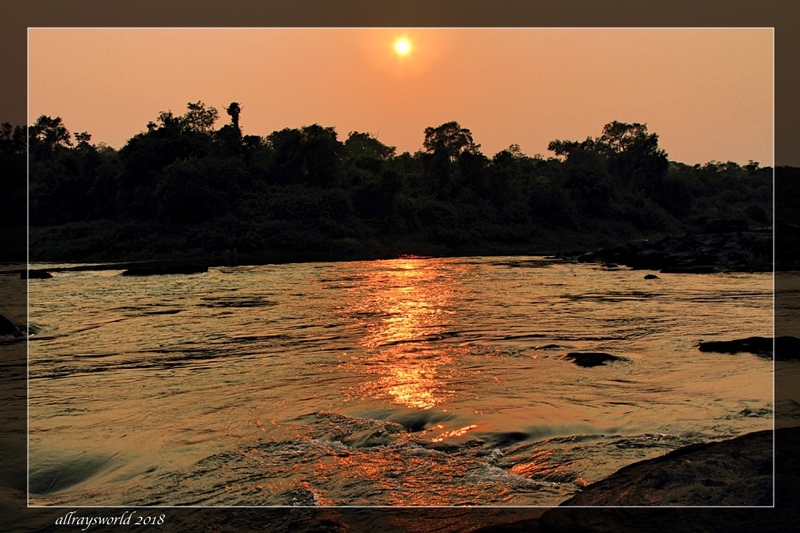 I remember a trip on the Zambezi with my sons, where the water looked exactly like this, in the setting sun. Ray: Sunset is a lovely time to be cruising on a river or lake, Louis. A very enjoyable trip Ray. Ray: Thank you, Bill. We enjoyed it, too. I have really enjoyed this trip with you and your friends Ray, once again I've seen places and things that I know I will never actually see in real life. Ray: Thank you, Brian. It is a wonderful region of Thailand, and little explored by foreigners. Lovely ending to a fine trip. Ray: Thank you, Tom. We enjoy these short trips. These are gorgeous sunset images, Ray - I particularly like the top shot with the soft movement of the water. Fun slideshow - thank you for taking us along on your trip! Ray: Thank you, Elizabeth. I loved the gentle wake, and the slow dance of the sun's reflection across it. Next week I am planning to take us to a part of India.